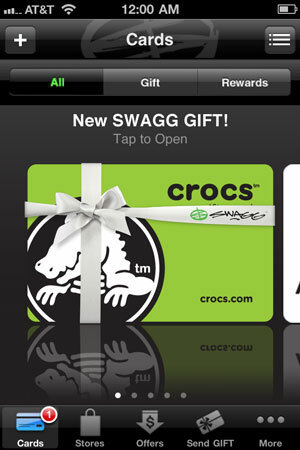 Just in time for the holidays, a new app form Swagg turns your smartphone into a virtual gift card. The number of store choices is limited for this holiday season but, overall, I see a lot of potential in this plastic-free approach—it's perfect for last minute gifts and there's no plastic card for the recipient to lose. The company offers a true app for iPhone and a sort-of app for Android – it’s really a shortcut that loads pages in your web browser, the same proceess for Swagg access with Blackberry and other web-enabled phones. Either way, the download is free. And for each person who downloads and registers for Swagg by December 31, 2010, SWAGG will donate $1.00 to the Stand Up To Cancer foundation. There are basically four functions available via Swagg. You can send gift cards electronically, which is a brilliant last-minute gift-giving idea. The limitation, though, lies in the number of companies currently offering this option. You can easily read the list aloud in one breath: 1-800 Flowers, American Apparel, American Eagle Outfitters, Buck Head Life Restaurants, Crocs, Live Nation, Omaha Steaks and Steve Madden. You can choose the store or let the recipient decide, but either way this is a very limited selection for now. 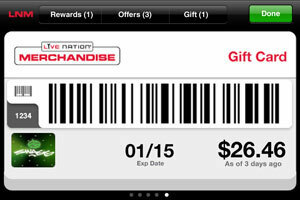 More interesting is the large number of retailers that let you convert your existing gift cards into electronic form by storing the ID numbers in the app. For example, I have a Starbucks gift card in my wallet. I entered the numbers from the back of the card into the Swagg system and voila – I can now call up a barcode on my Android phone display and let the barista scan it for payment. This is pretty slick, particularly as your holiday gift card collection mounts. And unlike the card purchase transaction, card redemption is available from hundreds of vendors, from Abercrombie & Fitch and Ace Hardware to Walgreens and Walmart. Another convenience feature is the option to store loyalty card information in your phone. I don’t carry a ton of these, but my pharmacy, supermarket and Staples accounts are all supported by Swagg, the numbers now conveniently stored in one place. Finally, there are offers, based on your location if you allow it. My current list includes discounts from several of the key sponsors listed above plus all sorts of offers on ice cream, donuts, bagels, Italian food, sandwiches and pizza. I think Homer Simpson may be in charge of negotiating these deals, but if you’re hot for a hot Quiznos sub, there’s nothing wrong with getting it for 10% less. Swagg is already an intriguing app. As they add more stores to the mix, being thoughtful will take a lot less thought in 2011. I believe it is the largest selection I’ve seen thus far.